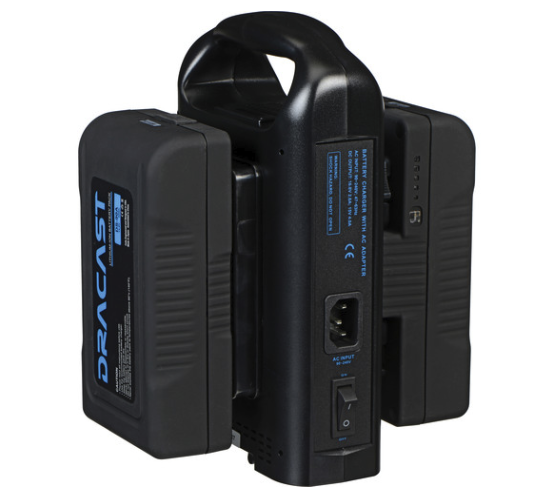 This Dracast Dual Battery and Charger Kit includes two 14.8V, 90Wh lithium-ion Gold-Mount batteries ideal for lightweight, run-and-gun setups, and a simultaneous dual-battery charger offering an XLR output for continuous power. Each battery also features a P-Tap output for powering accessories. The batteries are lightweight at approximately 2 lb and are designed with an ergonomic, ridged finger grip in the middle for better handling during swaps. A 5-LED array on the side of each battery indicates the remaining battery life. The charger is equipped with a carry handle for convenience during transport and an on/off switch that gives you more control over the available power. The charger can be used off of stored power or while plugged into a wall. It also features LED indicators on the side that specify whether the connected batteries are charging or whether the charge is complete. 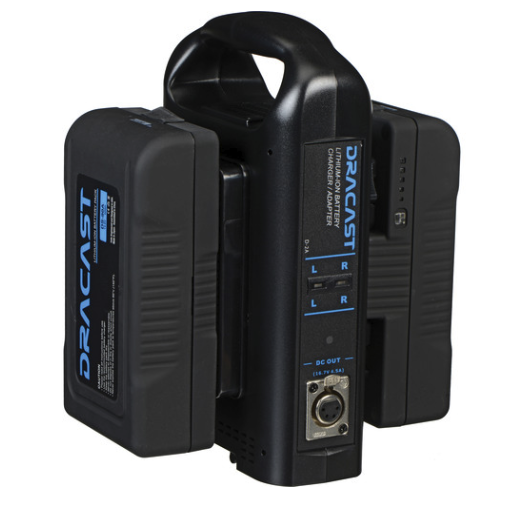 The Dracast 90Wh 14.8V Li-Ion Gold Mount Battery is a memory-effect-free battery for professional camera systems. It features built-in electronics to protect the battery during charging and use, charger is not included with the battery. The 5-LED battery system provides an indicator that shows you how much capacity the battery has left before it needs to be charged. It incorporates a D-tap power outlet, so you can power accessories directly, instead of through your camera’s electronics. With an operating temperature range of -4 to 122° F, the battery will keep working even in deep cold and extreme heat. 90Wh Li-ion professional mount battery pack does not suffer from memory effect, common to NiCd batteries. Fits camera and lighting units with Gold Mount battery bracket. The built-in LED battery gauge provides you with a clear visual confirmation of the battery’s capacity. The built-in D-tap connector allows you to power accessories directly from the battery, protecting your camera’s electronics from potential damage due to power hungry accessories. The battery incorporates electronic protection from over-charging, over-discharging, over-current-draw, external short-circuits, and non-equilibrium between its power cells. The battery will operate in temperature extremes that are uncomfortable for most people. Please note that as a general rule, battery capacity decreases as the temperature gets colder. Check your owner’s manual for instructions on charging cold or hot batteries. An attached rubber cover protects the D-tap connector when not in use. The portable DR-CH2A Dual Gold Mount Battery Charger from Dracast allows you to simultaneously charge two Gold Mount batteries (or a single battery) from 90 to 240 VAC sources. It features a top handle for easy transport and built-in capacity management system to ensure fast charging. The charger will automatically shutdown once the batteries reach their full charge. Additionally, the charger can function as a portable AC to DC power adapter, taking the AC power input and outputting 15 VDC at 4A via a 4-pin XLR connector. The output is only active when no batteries are attached. Box Dimensions (LxWxH): 7.6 x 4.6 x 2.6"
Box Dimensions (LxWxH) 10.6 x 9.6 x 5.9"